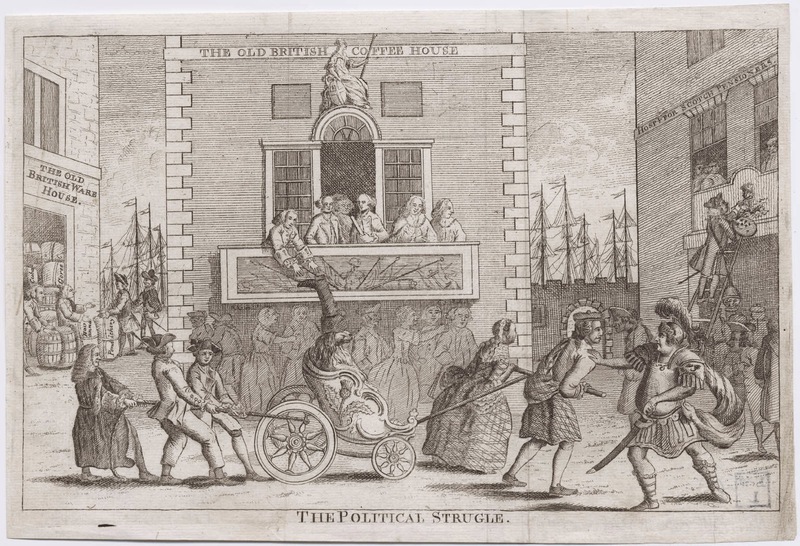 The Political Strugle, 1762, Walpole Library. 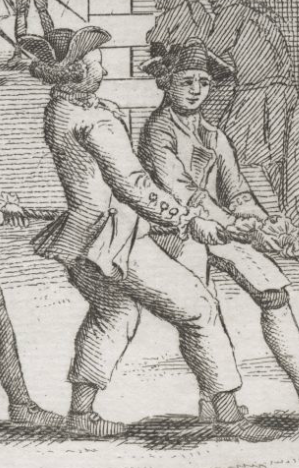 This cartoon is in the same category as Hogarth's "The Times." It appears to be addressing the debate in England over the cessation of hostilities during the Seven Years/French and Indian War. There are many figures doing a lot of different things (like a politician who for no discernible reason is putting a boot on the lion's head), but we're concerted with the sailor who tugs at the line tied to the lion's chariot wheel. Jack's hat is lined with white tape, and appears to be point forward, though the perspective means that I can't be certain about that. His hair is loose and curly, cut short well above this short jacket. The jacket itself hangs down to the top of the thigh, and is double vented. The top of each vent is marked with a button. His mariner's cuffs are buttoned shut. Plain trousers hang down to above the ankle, and we get just a peek at his shirt at the trouser's waist. His stockings are dark, but could simply be shaded. Rectangular buckles are affixed to his shoes.